Since I couldn’t go to the beach….I decided to bring the beach to my house this summer. It’s amazing what you can do with some sand, shells, and stuff from the stash. 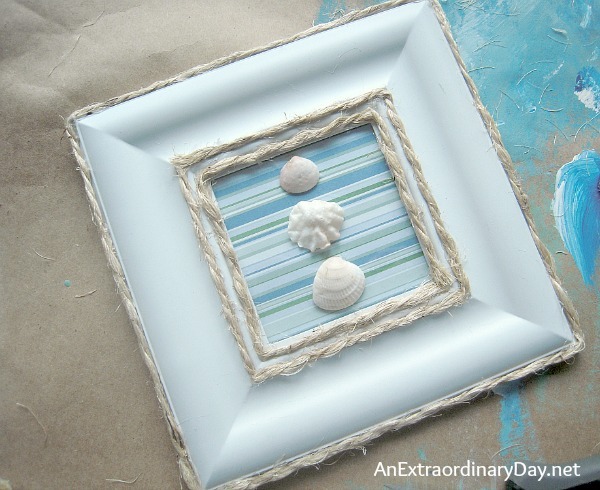 Join me for a super simple seashell art DIY project. Who knows why I purchased this small square photo frame at The Dollar Tree some time ago. As I was trolling my stash, I was so excited to find it, and the wheels started turning. Then I remembered I had some scrapbook paper in coastal colors. Yay! Originally I purchased it for making some masculine birthday cards. Certainly I could ‘steal’ a square. Using my handy-dandy Fiskars paper trimmer* I cut the scrapbook paper the size to fit the photo frame and then inserted it in the frame. Easy! The super easy part. Adding a few seashells. A dot or two of hot glue will secure them to the glass or acrylic. This photo frame didn’t have a stand, so I just leaned it up against a lamp, added some seashells, and created a vignette with my seashell art DIY project. Don’t you love quick and easy and inexpensive ways to splash your home with a coastal or nautical look? And since the girl couldn’t make it to the beach….well….the beach came to the girl….living in the mountains. Did you do any coastal/nautical decorating this summer? We all want to know all bout it. Splash us! I love it! It’s so pretty. Thanks for sharing. Awww…thank you so much, Marie!! So very creative! What a nice project it turned out to be for you. I like the scrapbook paper w/those tropical blues. And the items in your little vignette are so apropos! Very good job indeed! This did turn out very fun! The double twine plus around the edge gave it that extra eye-catching look. I did do a bit of coastal finds decorating. I used sand from two beaches in two clear cylinder vases to anchor taper candles on my mantle. I blue taped off anlgle lines at top and bottom of clear smaller cylinder type vases (crate & barrel) and sprayed them three different bright colors. My darker sand went in the bottoms just enough to appear they also are filled with sand. Seashells scattered around. Cut outs from a catalog of beach scenes I framed in square frames and hung with command strips. I faked them being hung together by using strips of Burlap pieces below between and thin burlap bow above–attached to wall with double sided tape. This was to the left of the sand and jars so I’d say it felt beach like although I never did make it over there this summer! 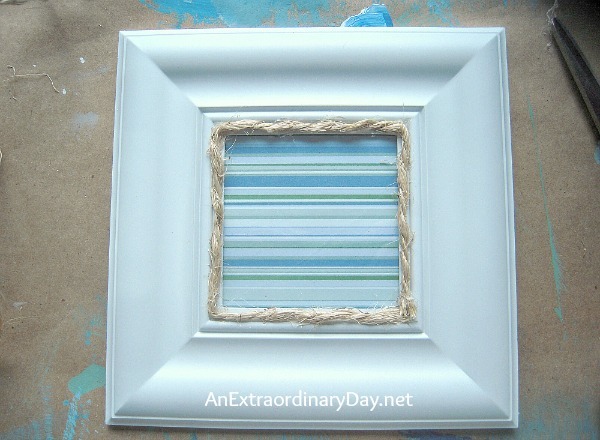 Ill have to incorporate your fancier frame idea for my square frames for next summer! Thank you for the idea. Your beach cylinders sound fabulous! I think you must be an artist. What creative ideas! I popped on over from Monday Funday. 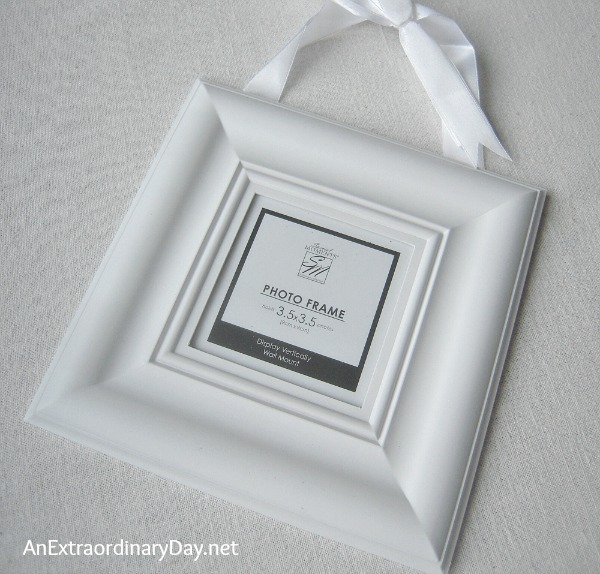 I love this frame – so pretty! Awwww…thank you so much Marie!! I love this, Diane! Something like this would go perfect in my front living room! Pinning and sharing on social media. Thanks for sharing at Marvelous Mondays! You just put the biggest smile on my face Julie! This is such a cute and simple project! Love it when things come together like that. Oh, I LOVE this! This sounds like the perfect thing to do with the seashells we collected on our trip to the beach last month! It’s amazing how easy and fun this was to do! How fun for you, Jen, to have been able to get away to the beach! It turned out well, Diane. I am surrounded by beaches so it’s no problem at all for me to get there, and I LOVE it. I’m going to miss it though. We won’t get there again until next Summer because it cools down pretty quickly here on the east coast of Canada. Thank you for sharing your nautical craft at my HOME. You are so blessed to live near the beaches, Sandi! I do enjoy going down in the fall….the water and skies seem so very dramatic. Wishing you an Extraordinary fall! I enjoy how you use dollar store items and things you have around the house. It looks smashing! Isn’t it fun to be able to discover all the things you can do with just the little you have on hand? Oh, the rope detail totally makes the frame! Love it! Thank you so much for your kind words Amber! I’ve had a lot of fun with coastal decor in small ways. Glad you found some inspiration…here. You just made my day. And made what I do so worthwhile!